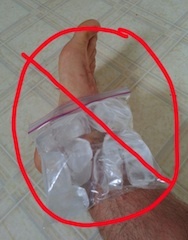 You may have also heard of the “R.I.C.E.”strategy for dealing with your sprains and pains: Rest. Ice. Compress. Elevate. You can find this suggestion repeated from Dr. Google, to clinics and gym rooms everywhere. What if this common sage advice isn't in your best interests? Ice dramatically slows the amount of blood flow to the injured tissue, which inhibits the amount of “good guys” whose job it is to clean up the injured area, lay down new tissue and make new blood vessels. Imagine calling 911, but not telling them where to go! But what about inflammation? Contrary to popular opinion, inflammation isn’t always a bad thing when it comes to acute muscle and joint injuries. Inflammation signals cells to come to the injured tissue, facilitates transmission of fluids and sets the stage for growing of new blood vessels and tissue fibers. Movement allows your lymphatic system to drain built up fluids, transport white-blood cells and decrease pressure at the injured site. Movement also keeps local and global muscles “turned-on” and providing support to the injured area. Muscle activation provides dynamic support and also helps minimize pain. How? Your nerves deliver more information on activity to your brain then pain—surely you’ve cut yourself and noticed it only after you stopped what you were doing? In fact, Dr. Ross Hauser has a better suggestion than R.I.C.E. for healing sports injuries. Say hello to M.E.A.T.! Move. Exercise. Analgesics. Therapy. Movement and Exercise go hand-in hand like peanut butter and jelly—the sum is greater than the parts. In fact the Academy College of Sports Medicine officially decreed: Exercise is Medicine! Analgesics will reduce pain, which will allow you to move more—see above—without inhibiting the inflammatory cycle like anti-inflammatories and ice do. Therapy can get to the underlying problems and imbalances that predisposed you to your tweak in the first place and get you doing exercises appropriate for your unique condition. So instead of icing and popping Vitamin I (ibuprofen), get yourself moving and exercising your tissues with issues; try over the counter or natural pain-relievers and consider a little physical therapy. Feel free to reach out to Dr Denny Kolkebeck, DPT if you think you need a little physical therapy for your tweaks and pains. His contact information is here. Hauser, Ross A., and Marion A. Hauser. Prolo Your Sports Injuries Away! : Curing Sports Injuries and Enhancing Athletic Performance with Prolotherapy! Oak Park, IL: Beulah Land, 2001. Print. “The Use of Crotherapy in Sports Injuries.” Sports Medicine 3 (1986), 398-414. 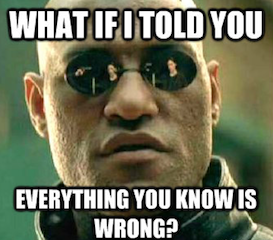 "What If I Told You Everything You Know Is Wrong?" Quickmeme. N.p., n.d. Web. 26 Mar. 2015.